Marco's Venice Tours & Photo Walks Journal Venice's Cats...where are they gone?? Venice's Cats...where are they gone?? With no living lions to reign over Venice, the local feline population has adopted a surrogate leonine role. 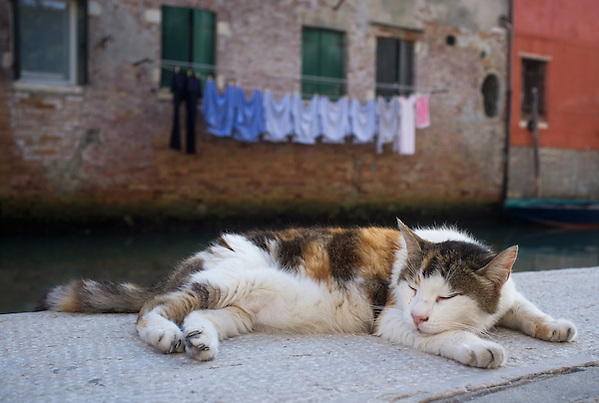 Back in the 1980s, when I spent my year in Venice as part of the national army service, cats were seen everywhere in the city: sunning themselves on park benches, perched on bridges, wandering the streets, and dining on leftovers at the Rialto fish market. Now the cat population has been limited mainly by laws and modern way of life, there are still few colonies the main ones are at Ospedale Civile (yes inside!) , at San Lorenzo near the Church, at Bacini, at Giudecca near Ponte Lungo at the Arsenale, there are quite few at the Lido and one at Torcello! There is an Anglo Italian organization Dingo part of AISPA that works to feed, protect and maintain colonies in a healthy and modern way, they also run the "gattile" (Cattery) at Malamocco. Despite several misconceptions and a bit of Italian racism there are no proofs (!!!) that Dingo or the Cinese people are responsible for the disappearance of cats from Venice! In a brilliant book titled A Venetian Bestiary, Jan Morris wrote:"The cat has always been an essential scavenger in a city that depends on the tides for its hygiene, and has periodically been decimated by rat-borne plagues. It was Shylock the Venetian who declared the cat to be 'both necessary and harmless,' and when from time to time the municipality has tried to reduce the teeming feline population, the citizenry has always been up in arms in protest. Your Venetian cats are not like others. Sometimes of course they live in the bosoms of families, and are fed on canned horsemeat, and prettied up with bows: but far more often they survive half-wild, in feral gangs or covens of cats, and not infrequently some cherished household pet, observing the lives of such lucky ruffians from the kitchen window, will abandon the comforts of basket and fireside rug, and take to the streets himself."